I have to say that I'm pretty thrilled with how fast January is going by for me. January is one of the longest months of the year and it always seems to drag on. I'm always ready to move on to February. The days start to get longer, it slowly starts to get warmer (at least it does in Las Vegas.) Valentine's Day is around the corner, and then before you know it, it's St. Patrick's Day and then spring break is here. Something I really start to miss in January, besides the sun are dresses. I feel like I rarely wear dresses during the winter. The thing is, I have dresses, and they are actually really easy to wear in the winter. You just have to layer them up a bit. 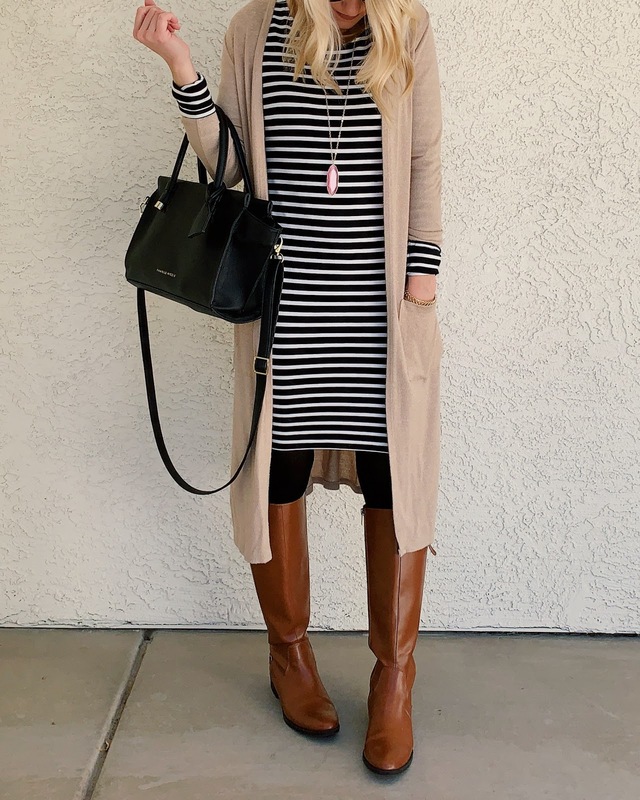 Today I want to share with you one of my favorite winter dresses and how I styled it for winter. *This post contains affiliate links, which means that by clicking on and/or making a purchase through a link, I will earn a commission for this blog. Thank you for your support! I bought this long sleeve fitted striped dress at H&M way back when I was pregnant with Jack. I loved it when I was pregnant, because it showed off my bump perfectly. (See how I styled it as a maternity dress HERE and HERE) Since then, I've worn this dress several times. It's just a really great basic dress to have in your wardrobe. It makes for a great winter dress. For this look today, I styled it with my tan duster from Forever 21 and my riding boots, that were a recent thrift find. In the winter, I usually wear leggings or tights under my dresses. For this look I'm wearing a black pair of tights that I actually bought at the grocery store. I guess tights are tights, so these are nothing fancy. My necklace is new. It's a clearance find from Nordstrom Rack. I love how it adds a touch of color to all my outfits. My purse is my favorite purse in my closet. I love having a simple black satchel purse in my wardrobe. It can be worn with everything! The thing I love about this look is that it can be warn almost anywhere. Out for lunch with friends, to work, to church... it's just a simple way to dress up your winter style a little bit.